Maurice Denis (1870-1943) was one of the original members of the Nabis group of self-styled artistic prophets, joining with Pierre Bonnard, Xavier Ker Roussel, and Edouard Vuillard. The chief theoretician of the group, Denis' Manifesto of Symbolism (1890) insisted that whatever else a picture is, it is "essentially a flat surface covered with colors assembled in a certain order," an important precursor of abstract art, although he was far more interested in finding the divine in the everyday. Many of his later works are devotional images. Selecected bibliography: Jean-Paul Bouillon, Maurice Denis: Le Spirituel Dans L'art (Paris: Decouvertes Gallimard, 2006); Pierre Cailler, Catalogue Raisonné de l'oeuvre Gravé et Lithograpjié de Maurice Denis (Geneva: Éditions Pierre Cailler, 1968); A. Dayez, Maurice Denis: Orangerie des Tuileries, 3 juin 31 août 1970 (Paris: Réunion des Musées Nationaux, 1970); Agnes Delannoy, Maurice Denis, 1870-1943 (Paris: Cercle d'Art, , 2004); Agnes Delannoy, Maurice Denis Dessinateur: L'oeuvre Devoile (Paris: Sogomy Editions D'art, 2006); Edouard Julien, Exposition Maurice Denis Peintures - Aquarelles - Dessins - Lithographies. Du 28 juin au 29 septembre 1963 (Albi: Musée Toulouse-Lautrec, 1963); Albert Kostenevitch, Bonnard and the Nabis : Edouard Vuillard, Ker Xavier Roussel, Maurice Denis, Felix Vallotton, Bonnard : Schools and Movements Series (Bournemouth, England: Parkstone Publishers / Aurora Art Publishers, 1996); Kunsthalle Bremen, Maurice Denis. Gemälde, Handzeichnungen, Druckgraphik. Mit zahlreichen Bildtafeln, tlw. farbig. Meisterwerke des Nachimpressionismus aus der Sammlung Maurice Dennis. Ausstellung Kunsthalle Bremen 17. Oktober bis 5. Dezember 1971 (Bremen: Kunsthalle Bremen, 1971); Frédéric Martinez, Maurice Denis. les couleurs du ciel (Paris: CERF, 2007); Serge Lemoine, Jean-Paul Bouillon et al, Maurice Denis: Maestro del Simbolismo Internazionale (Paris: Musee d'Orsay and Skira, 2007); National Museums and Galleries, Liverpool, Maurice Denis: 1870-1943 (Merseyside: National Museums and Galleries, 1995; 374pp, 320 ills (100 col). With a catalogue of the artist's paintings). 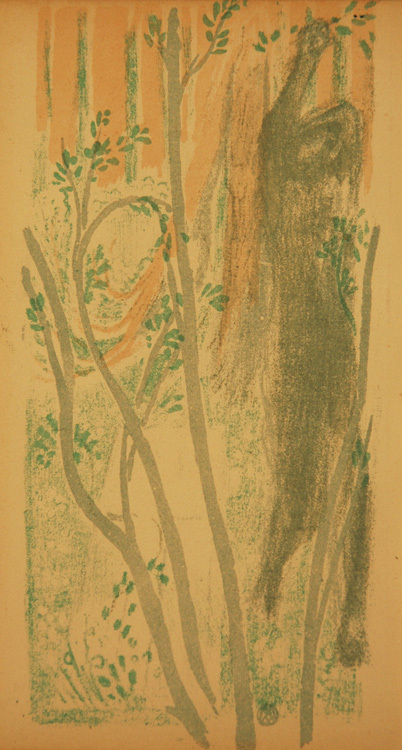 Le forêt mysterieuse (original color lithograph, 1897. Published in the journal L'Eremitage in an edition of c. 1000 impressions. Our impression was included in a show at the Madison Art Center entitled Madison Collects Modern Prints in 1984. One of Dennis' most beautiful early color prints; slight browning at edges, not affecting the image. Image size: 172x107mm. Price: $1750.